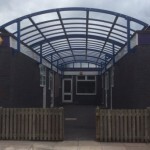 Twinfix bespoke canopies make great learning and play spaces for children of all ages. 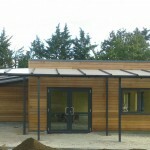 Individually designed for each location, they are available with a range of roof shapes. 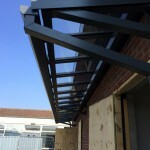 Canopies may be a lean-to design if the construction and height of the building walls is acceptable, or free-standing where this is not the case. 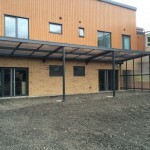 Whilst the frames are usually non-rusting aluminium that may be powder coated in many different colours (included within our standard price), they are also offered with a timber structure should this be preferred. 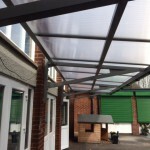 When you order a canopy from Twinfix you can be confident that it is an easy one-stop process as we have our own design, planning and installation teams, who will work seamlessly with our sales staff to ensure that your build runs smoothly. For a more complicated design we also do a dry-run assembly of the structure before sending it off for powder coating. This helps ensure that the final build on site goes smoothly. 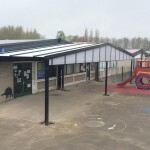 Due to health and safety recommendations, the norm for a Twinfix school canopy roof is usually tough multiwall or solid polycarbonate roof glazing panels that conform to the non-fragile requirements of the drop test outlined in ACR[M]001:2014. 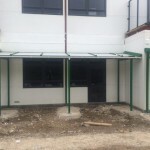 You can choose from a range of tints in both the solid and the multiwall polycarbonate, depending upon the requirements of your site. 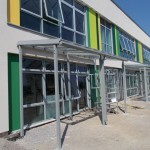 We even have a Georgian wired look-alike solid polycarbonate for Heritage projects. Where multiwall is the preferred choice we generally recommend 25mm multiwall rather than 16mm, as the thicker material with its complex internal X structure helps to cut down the drumming sound of rain that may be heard when using the 16mm product. 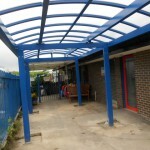 Our canopies and walkways may be installed either during term time or during holiday periods. Installation usually takes place over two phases. 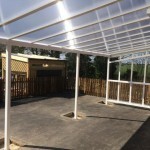 Groundworks are put in place, then covered over and left to set. One of our installation teams will fit the actual structure a few days later. 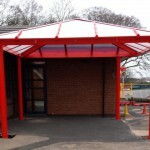 These canopies have proven to be of great use in many schools, where not only are they used for learning and play, but they often also accommodate coat hooks or lockers enabling pupils quick and easy access to their jackets. Some schools, particularly nurseries, also request the fitting of colourful padded post protectors for additional safety. 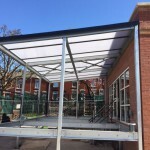 Yet other schools use their canopies as outside canteens – a much more economical and quick to build solution than a traditional bricks and mortar extension. Whatever your needs, do get in touch with our team for a discussion on your requirements.